Executive Chef Heinrich Lauber of La Terrasse, the 16 points GaultMillau restaurant at the Bellevue Palace in Bern, Switzerland, shares his recipes for a delicious three-course dinner. Not many chefs can say that they were invited three times to the White House by United States Presidents (Bush, Reagan, and Clinton); then again, not many chefs have such as interesting life as that of Executive Chef Heinrich Lauber of La Terrasse at the Bellevue Palace. He is a member of the Club des Chefs des Chefs, an elite membership of chefs for Heads of State, and it was in this capacity that he was invited to the White House. In addition to his Executive Chef position at the Bellevue Palace, he also cooks when there is a state visit to Parliament, located next door to the hotel. Now approaching his 25th year at the Bellevue Palace, Chef Lauber's career has taken him around the world, working with Hilton Hotels for twenty years in (Rome) Italy, Kuwait, Malta, (Caracas) Venezuela, (São Paulo) Brazil (where his son was born), (Amsterdam) Holland, (Cairo) Egypt, and (Geneva) Switzerland before joining the Bellevue Palace. Chef Lauber is someone that has always wanted "to look to the future." When the owner of the Bellevue Palace approached him re: working at La Terrasse, he told the owner his culinary plans, and the owner said, "Okay, do what you want." Chef Lauber said, "We do what we want in the kitchen; it is a wild kitchen, and an honest kitchen." His diligence has earned him 16 points GaultMillau, to which he modestly added, "How I obtained the 16 points during my time, I do not know." Having seen this dynamo in action, and tasted his culinary prowess, he earned the points the old fashioned way, through dedicated hard work and passion. Method: Cook the pumpkin until tender, mash and season to taste with fresh cream, butter, salt and pepper. 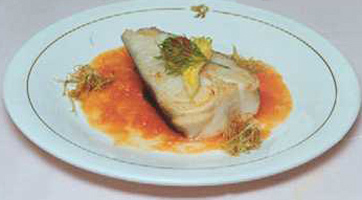 Preparation: Season the halibut with the salt and pepper, add lemon juice and olive oil, and panfry the fish. Deep-fry the scallions and place on top of the fish, and garnish with the hearts of celery leaves. Potato basket (deep-fried using a basket maker) small roasted potatoes, artichoke bottoms, and an assortment of wild mushrooms found at the market (steinpilze, pfifferlinge, and fresh shitake). 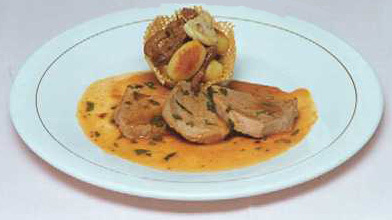 Presentation: Arrange the roasted veal on a plate and pool the reduction sauce around the meat, top with the potato basket filled with the roasted potatoes, artichoke bottoms, and mushrooms. Preparation: Place half of a pear in puff pastry cut to resemble a pear, and bake. 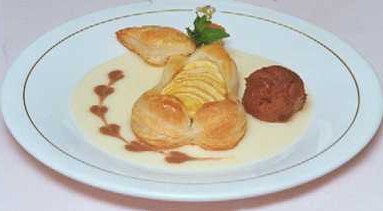 Meanwhile, thin pastry cream with whipped and fresh cream mixed with Poire William Brandy. Serve the dessert warm, with cocoa sherbet or chocolate ice cream. Presentation: Place the pear in the center of the plate, pool the sauce around the pear, place the sherbet off to the side of the pear, and decorate. Read other articles on the Bellevue Palace in the Hotels and Resorts and Restaurants sections. Read other articles on Switzerland in the Destinations, Hotels and Resorts, Restaurants,Chefs' Recipes, Spas, Liquor Cabinet, Wine Cellar, Gastronomy, Luxury Products, and Adventures sections.